The concept of effective stress and the effective stress equation is fundamental for establishing the theory of strength and the relationship of stress and strain in soil mechanics. However, up till now, the physical meaning of effective stress has not been explained clearly, and the theoretical basis of the effective stress equation has not been proposed. Researchers have not yet reached a common understanding of the feasibility of the concept of effective stress and effective stress equation for unsaturated soils. Focusing on these problems, new viewpoints for explicitly elucidating the effective stress and deriving the effective stress equation are given in this paper, including that the effective stress should be defined as the soil skeleton stress due to all the external forces excluding pore fluid pressure, and that the soil skeleton should include a fraction of pore water which can bears and passes the load together with soil particles. 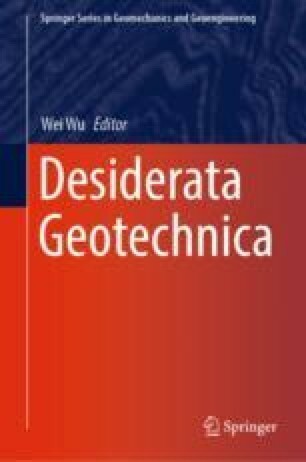 The relationship between the effective stress and the shear strength and the deformation of unsaturated soils is preliminarily verified by experiments and quoting test data from literature.